Normally I start with a joke, but I’ve already used up a bunch of time, so I will give a quick one. Why should you never fall in love with a pastry chef? Because they will dessert you. I know it is not good, but it was brief. Today’s subject is love. Now the dictionary defines love as “an intense feeling of deep affection” or “a great interest and pleasure in something.” Now those definitions don’t really capture what love truly means. If you have been married for 50 or 60 years you have had a moment or two where you have not exactly had intense feelings of deep affection for your spouse, yet you still love them. The love you have for your children is so much more than just having a great interest in their lives. Love is much more than a good feeling or an emotion. Mister Rogers was an ordained Presbyterian minister and in a recent documentary about his life he says, “Love is at the root of everything.” A mere feeling or emotion is not at the root of everything. The truth about love is found in today’s second reading, which is a poem about love. 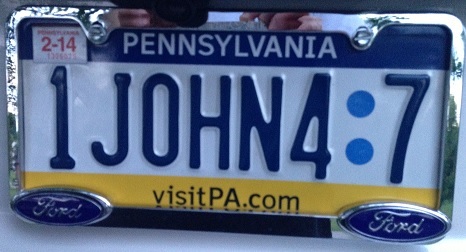 I said earlier that I have a bible verse as my vanity plate: 1JOHN4:7, the first verse from today’s second reading. This verse says, “Beloved let us love one another because love is of God; everyone who loves is begotten by God and knows God.” The verse that follows it says, “God is love.” These verses tell us that love is more than a feeling, love is God himself. These verses tell us about how intimate our relationship with God is. He created us out of love, he reveals himself to us through love, and most importantly he just simply loves us so much that he gave us his son our Lord Jesus Christ to save us. But true love is unconditional. You must love your spouse, your family, your children unconditionally. Barbara Bush said, “You have to love your children unconditionally. It’s hard. But it is the only way.” She must know something because not only was she married to a president, she also raised a president and a governor. True love, like God, is everlasting. The reason that I have 1JOHN4:7 as my vanity plate was because my grandmother gave me a plaque with that verse on it. It is very special to me, not only because it reminds me of her, but because it reminds me of how she was and how I should be. I was not the best of kids growing up. I was could be angry. I got into trouble. I lived with my dad, then my mom, and I eventually I ended up with my grandmother. It was not easy, in fact at times it was probably impossible, but she did it. Did she ever get angry? Yes, in fact you should have seen her the day I told her I was going to become Catholic, she was not happy! But no matter how what I did or how I treated her, she always forgave me and loved me unconditionally, and it changed my life. How can we love when it is so hard sometimes? How did Barbara Bush, or my grandmother, or anyone else love at those times when it is hard or almost impossible? By turning to God, love itself. So often I would find my grandmother praying, sometimes literally on her knees. She didn’t have an infinite supply of love to give. But she knew where to get more. We need to return to the source of love to renew our supply because our love is limited and needs replenished. If we rely on ourselves for others for love, without including God, we are going to fail. One of the problems in the world today is that as God begins to fade from our society, so does the love. The shootings, violence, hate, poverty, broken families, and most everything wrong in the world is a direct result of the world not sharing love. It cannot share what it does not have. It must turn to God and receive more. Ultimately the love that we show others reflects the quality of our relationship with God. As the second reading says we “love one another because love is of God” and “everyone who loves is begotten by God and knows God” and it’s “not that we have loved God, but that he has loved us.” God is the source of love, an unlimited supply of love. That is how we share it with others, with those we don’t like or agree with and with those that have hurt us or disappointed us, we receive God’s love and share it with others. Jesus says in the gospel today, “Love one another as I love you” and “to lay one’s life for one’s friends.” We can’t do that on our own. It’s more love than we have. We need God. We need Jesus. As I said earlier, we have a God that created us out of love, he reveals himself to us through love, and most importantly he just simply loves us so much that he gave us his son our Lord Jesus Christ to save us. We need to receive this unlimited love to share it with others. We can’t do it on our own. Pope Francis has written a new apostolic exhortation and it is about everyone having been called to a life of holiness and in it he quotes Pope Benedict XVI, saying, “Holiness is nothing more than love lived to the full.” That is what our Lord did for us. He lived his life to the fullest and died out of love for each one of us. God is where we replenish our supply of love when it runs out. That infinite love is what we share with others. That love is our path to holiness. Our Lord loved us so much that he died for us. Receive that love and be holy and then you will truly rejoice and be glad! Wonderful Homily Deacon, if we could all live and love like Jesus and(Barbara Bush) what a wonderful world it would be. We aren’t perfect but we could try a little harder to be loving and kind!